Tag Clouds make good Advent and Easter mirrors. Who knew? Episcopalians, in our neck of the woods anyway, are a small and remarkably insulated bunch from the goings on in the wider Christian community. That was why I was surprised to be fielding questions from the outside world regarding a blog post that amounts to Episcopal insider baseball. Father Robert Hendrickson, a bright light of a young priest working in a diocesan cathedral, recently made a tag cloud of our Presiding Bishop’s Christmas message. He compared the key words revealed by her cloud to those of Pope Francis’ recent Lumen Fidei, and described her sermon as “bordering on gnosticism.” Last year he compared tag clouds of her Easter sermon to those of the Archbishop of Canterbury, the Presiding Bishop of the Evangelical Lutheran Church, the Pope, and even Ricky Gervais’ atheist Easter message. Let’s just say that, from the tag clouds, even the atheist’s message appears to have significantly more Christian content. In cloud format our Presiding Bishop’s sermons appear to be long on insider lingo and social engagement and low on Jesus…that there just isn’t much “there” there. For one, they reveal a very odd concept for those not of our tradition to grasp: That Episcopalians, as a rule, crucify neither our orthodox nor our gnostics. Our Presiding Bishop will not, as my evangelical friends would like, be charged with violating Christian orthodoxy, nor will her critic’s career be harmed, as many of my progressive friends would like. The ability to stomach dissent, although under fire, is a historic and endearing quality of Episcopalians, a group theoretically not together on theology as much as on the agreement to pray the same words. However, the theory that “we need not agree” has limitations. I am no fan of Confessional statements, but if there is no real creedal and quadrilateral agreement binding us together as Episcopalians, around what will we orbit when we write the prayers we will pray in unison? There is a core to the faith that makes us recognizably Christian. Or not. Father Robert’s tag clouds also reflect a growing awareness that our missional strategy – the Episcopal church as “Christianity lite,” a doubt embracing, culturally accommodating, theologically easy onramp for those wanting to consider a practice-based rather than a propositional faith, has not worked very well…in many places we appear to have a creeping universalism that seems lumpy and out of date. Like a microfiber sofa, public doubts about core teachings (resurrection anyone?) and “all roads lead to God” do not make an attractive invitation to come check us out. Our Sunday attendance numbers since our last national leader was selected bear this out: 765,000-640,000 from 2006-2012. Finally, in Father Robert’s tag clouds we see a hint of what is for me, a person who has spent his adult life working with people from 18-35, a seismic and positive generational shift: Young Episcopal clergy and bishops are both more progressive politically and more traditional theologically. And they are not content to sit on the sidelines and wait for the boomer generation with its (and I do believe this is missionally-motivated) theological fuzziness to get out of their way. 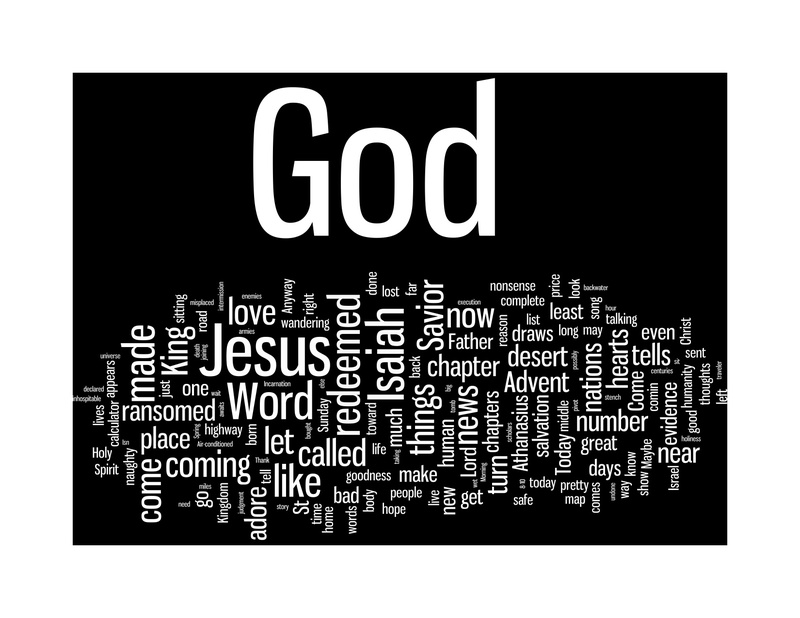 Out of curiosity I made a tag cloud of my sermon for this weekend. I preached out of Isaiah 35 as part of an Advent series, so I expected its references to Jesus to be lowish. Also, my purpose was to sneak up on the Christian message: That just as the Holy Spirit had dropped Isaiah 35 as seemingly a word out of place in the middle of Isaiah’s judgments on Israel, Jesus is God’s Word out of place, dropped into history where least expected. Still, my references to God: Father, Son and Holy Spirit, were minimal enough in the key words that it caused me to cringe like a glance in a mirror at a look that just doesn’t work. Missing too was any indication of our need for a savior. I tore the sermon up and went back to the drawing board. It is not my first rodeo. I know that people come to church quietly desperate for help. If I, as the proclaimer, hold up a fun-house distortion of the Gospel…one that merely reflects back at people what I think they want to see, well, shame on me. I know that the hungry do not need the illusion that we are spiritually well-fed, when in truth we are starving for a Savior. If I fail to hold up a mirror of our deep brokenness and need and then bring the true comfort of the transforming Good News that the Creator of the universe loved us too much to leave us alone, then why bother? God entered our world, not just to demonstrate how to live, but to finally redeem us on Calvary and rise in victory. Christ returned to the Father to intercede on our behalf as his Spirit makes us a people and sends us to extend his Good News in word and deed. Less than the whole Gospel is an unhelpful diet, white bread for the soul. 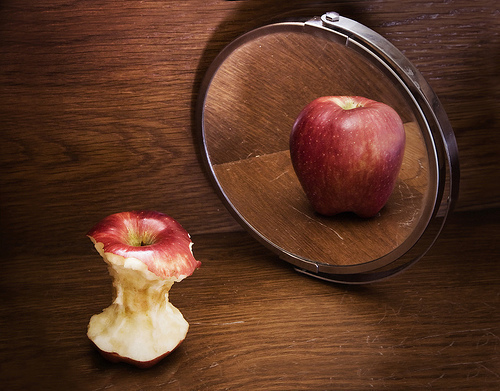 Looking into a mirror that distorts an emaciated spiritual reality may comfort for a while, but eventually hungry people will go somewhere else, some place a meal is served. « How do millennials experience your church? > There is a core to the faith that makes us recognizably Christian. Or not. Hmmm. It would seem to me that in fact, right from the Biblical text onward, there has been a CONVERSATION (well, actually sometimes it has been a dog-eat-dog fight to the death) to the question, “But who do you say that I am,” that makes us recognizably Christian. Or not. A catalog of Christian core teachings would in fact fill many shelves – and contain many teachings that were at one time official doctrine – and at various times were also deemed heresy. I hate to say it, but actually there is no link between your sermon content and worship attendance decline – or increase. I am not saying that sermon content is not of critical importance – only that preaching perfect sermons week in week out is not what impacts national worship attendance data. Your bishop might improve her sermons, but people are just not going to church like they used to for a host of reasons that have nothing to do with what we do in church. But I liked your idea of making a tag cloud of my sermons. A very helpful way to get a snap shot of what I’m actually communicating! Thank you for bringing your thoughtful comments to the discussion. I actually do think there is a correlation between preaching and attendance. If there wasn’t, Andy Stanley wouldn’t be piped into 43 separate venues each Sunday morning. The problem is that it is so incredibly difficult to develop that level of expertise. Mega church guys work 20 hours a week on sermons for a decade…that gets one to Gladwell’s 10,000 hrs to develop excellence. In a small church someone gets 5-6 hours a week to work on the sermon. It would take 40 years to get to that level of time investment. That makes it very difficult for faithful servants of God in smaller churches. You are right that the percentage of people attending church is decreasing. At the same time, I cannot deny that some churches are growing quite rapidly. For example, Perry Noble’s church in Anderson, SC grew by more people last year than there are people in all 60 of Arizona’s Episcopal Churches (8000). Thanks for bringing your voice to this. You added a bunch and allowed me to sample a topic that I am thinking about but haven’t committed to paper.